According to a new report by a Seoul think tank, Kim Jong-un’s younger sister is in charge during his absence. Kim Yo-jong, the younger sister of North Korean leader Kim Jong-un, might be leading the hermit kingdom instead of her brother, a recent report from Seoul-based think tank, North Korea Intellectuals Solidarity (NKIS) revealed. According to NKIS on October 1, Kim Jong-un — who has failed to appear at official events since early September — is getting medical treatment at Bonghwa Clinic from both domestic and foreign medical teams. Meanwhile, in his absence, Kim Yo-jong is charged with handling important government decisions. An unnamed source told NKIS that a decision to give Kim Jong-un extended medical treatment was made at a meeting of the Political Bureau of the Central Committee of the Workers’ Party of Korea on September 6. The meeting was reportedly held at Kim Yo-jong’s suggestion. As a result of the meeting, Pyongyang decided four things. First, to give special and extended medical treatment to Kim Jong-un in order to quickly restore his health. Second, all North Korean high level officials and party members should be responsible in following Kim’s previous orders. Third, the party and army should be on wartime-like alert while Kim Jong-un is out of commission. Lastly, all the important matters related to government administration should be reported to Kim Yo-jong, so that Kim Jong-un can concentrate on getting better. Kim Yo-jong is the daughter of the former North Korean leader Kim Jong-il and his wife, Kim Yong-hui. She was first spotted at a photo session for participants at the 3rd Conference of the Workers’ Party of Korea in September 2010, when she stood next to her father’s personal secretary. She was officially mentioned for the first time on March 9, 2014, as she accompanied her brother in voting for the Supreme People’s Assembly. She was identified as a “senior official” of the Central Committee of the Workers’ Party of Korea. She is widely seen as having taken over the role of her aunt, Kim Kyong-hui, the wife of the executed Jang Song-thaek. Kim Kyong-hui supported her elder brother Kim Jong-il during his rule. “Some say Hwang Byong-so, director of the General Political Bureau of the Korean People’s Army, may have assumed new No. 2 status, but given what has been confirmed this time, we can say Hwang is just a shadow, and Kim Yo-jong is the second-in-command of North Korea,” said Kim Heung-gwang, the head of NKIS. Meanwhile, speculation over Kim Jong-un’s sustained absence continues unabated. South Korea’s Yonhap News Agency reported, citing an unnamed source, that he is suffering from gout. A Daily Mirror report said that Kim Jong-un is addicted to Swiss cheese, which may have contributed to his health problems. Curtis Melvin, a researcher with the U.S.-Korea Institute at Johns Hopkins University, told Foreign Policy that Kim Jong un spends much of his time at the family compounds in Wonsan and Kangdong. The family compound in Kangdong is where Kim Jong-il recovered from his stroke. 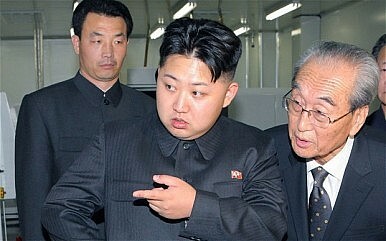 In addition, Free North Korea Radio (FNK) reported on September 29 that Kim hadsurgery on his ankle. The surgery was reportedly successful. However, the South Korean government has refused to confirm that Kim is suffering from any health problem. “I think it is hard to relate Kim’s absence to his health since there used to be a time when Kim disappeared from official events [for] over ten days,” said Lim Byeong-chul, a spokesman of the Ministry of Unification.